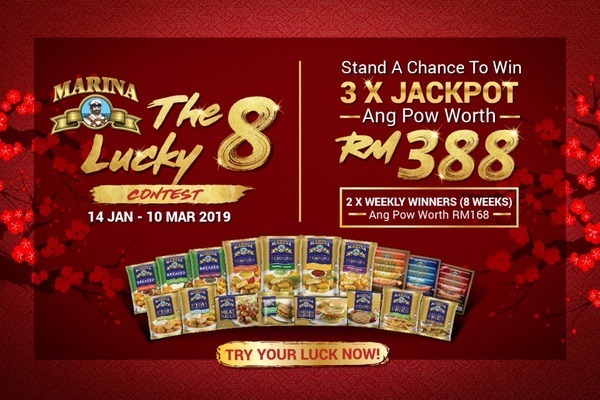 Two winners will get an Ang Pow worth RM168 every week AND there are 3 special JACKPOTS worth RM388 up for grabs 😱 The best part? Entering is so easy! All you have to do is purchase any of Marina products, answer 2 simple questions and submit the correct answer with your proof of purchase. Multiple entries with different valid proof of purchase is acceptable, so go on and try your luck today! 1. Contestants must purchase any 1 (ONE) of Marina product from any retailers during the promotion/contest period and must retain the original receipt as “Proof of Purchase” to enter the promotion/contest. • Upload the photo of receipt as “Proof of Purchase” and fill in the receipt number.